Synopsis: In the distant future, a new immortal and genderless life form called Gems populate the Earth. The 28 Gems must fight against the Lunarians, who attack them regularly to abduct them and to turn them into decorations. Each Gem is assigned a role, such as a fighter or a medic. Being only 300 years old, Phosphophyllite is the youngest of the Gems and has no assignment yet. They want to help to fight the Moon Dwellers, but are too weak and brittle for battle. One day the master of Gems, Kongou (Adamantine), assigns them the task of creating a natural history encyclopedia. Now that we’ve gotten that out of the way, let’s talk a bit about the story, which seems simple and straightforward, but that’s part of the beauty. The story barely scratches the surface of what’s going on in this universe, and while that sounds bad, I think the sense of mystery and intrigue add a lot to the story. Even when the final credits roll, there are still nearly as many questions as answers, and if there’s any justice in the world, we’ll get another season that’ll answer some of those lingering questions. The pacing is a little slow, but that allows us a little more time to get better acquainted with the various Gems, and since there are so many of them, it’s actually pretty convenient. The brief insight into the finer details of the underlying story are fascinating, but little comes of it, as matters quickly return to the usual rinse-wash-repeat cycle of Lunarian attacks that the Gems work to thwart. It feels like the story is building up towards something greater, but that just doesn’t occur before the season comes to an end. Such a shame, yet it isn’t that bad, since there are still more than enough things going on to keep things interesting. However, along the way, you could say the table gets set, with several characters slowly becoming critical to the narrative that’s being told. And it isn’t until the theoretical second season that the real major developments transpire, though, that wouldn’t be possible without the methodical story planning seen here. The conflict between the Gems and the Lunarians is very engrossing, even if it is drawn out a little too much for my liking. P.T. Barnum once said “Always leave them wanting more.” It seems like that’s the mantra that Houseki no Kuni (TV) lives by, and in this case, it’s very fitting. Where are you, season two? Phosphophyllite, or Phos for short, is the main protagonist in this show, and as the youngest of all the Gems (at three hundred years of age), she also comes across as the least skilled or useful. Unsurprisingly, she has a lot of personality and is very outspoken, and for that reason, it’s extremely easy to like her. At a three-and-a-half on the Mohs scale, she’s rather fragile, but she strongly desires to be more useful to the group. I wouldn’t say that there’s a lot of comedy in this anime, but it’s certainly not completely devoid of humor, and Phos supplies a lot of it, which further helps to endear her to the audience. At one point, Phos undergoes a personality change that sees her become much more serious and resolute, so we get to see a completely different side of her. I’d be lying if I said I didn’t prefer her in the role of playful troublemaker, yet it’s cool to see that there’s more to her than that. 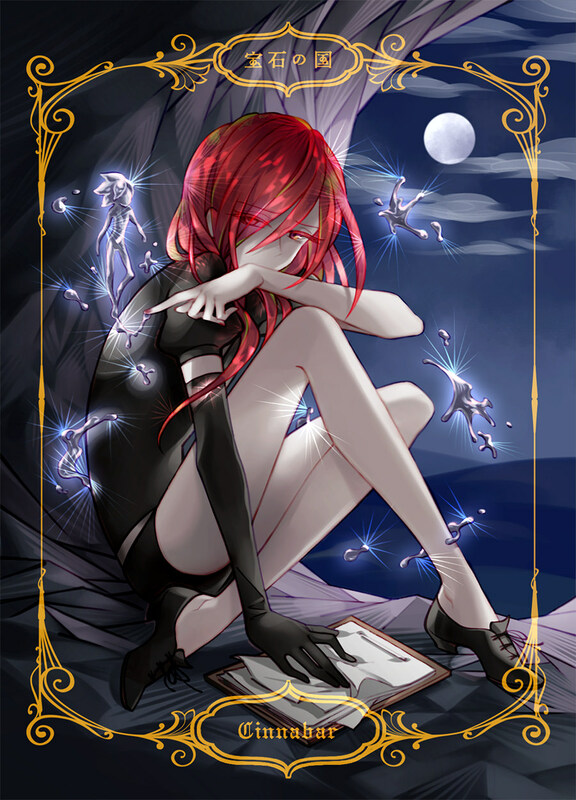 Phos was definitely a good character, but even though she’s absent for large portions of the show, I can’t help but love Cinnabar. Living a life of solitude thanks to the toxicity of the mercury content in her composition, she’s one of those unfortunate souls that you just feel for and want to see live a better life. Her distrust of others doesn’t stop Phos from attempting to befriend her and help her out, and that’s an overarching storyline that lasts the entire season and helps to bring about some yuri vibes. With a hardness of two on the Mohs scale, I believe she’s the most fragile mineral of all the twenty-eight Gems—or at least the most fragile of the ones who get somewhat significant screen time, not counting Antarcticite—and at least emotionally, that definitely comes across in the anime. Many other characters make positive impressions, including Antarcticite, Alexandrite, Amethyst, Yellow Diamond, Zircon, Rutile, Red Beryl, Padparadscha, Morganite, Euclase, Jade, Ventricosus, Aculeatus, and I can’t forget about the big man in charge, Kongou-sensei. With so many characters, some get more screen time than others, though, they all bring a little something different to the table that makes them all seem pretty likable. And let’s not forget about the Lunarians themselves. We’re told very little about them, and they only appear to conquer and return the fragments of defeated Gems back to the Moon, where they reside. So they’re silent and emotionless, yet they still somehow manage to be great villains that you desperately want to learn more about. How does that happen? I think their visual design probably plays a factor in their appeal, as they’re not the generic and uninspired antagonists that you’ll sometimes find in other series. Sometimes, less is more, and I feel like letting our imagination run wild with speculation was a good decision that made them even more compelling. All in all, I was pretty surprised that I came to care a lot about some of the characters. 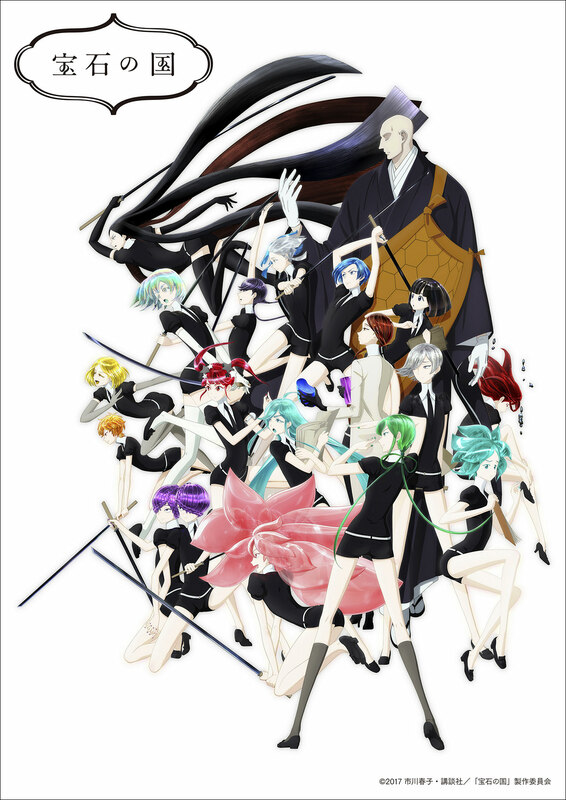 There’s a decent amount of character development, and, of course, the yuri subtext mainly involving Phos x Cinnabar and Bort x Diamond adds another layer of enjoyment to an already enjoyable cast of characters. I would’ve liked to have seen a few characters a bit more, but I really can’t complain too much. Upon hearing that this series was almost exclusively comprised of CG, I think I might have shuddered a little bit. Black Rock Shooter (TV) is an anime that immediately comes to mind that features a lot of CG, as do the offerings of anime studio Polygon Pictures, but I feel that stigma still exists towards CG in anime. 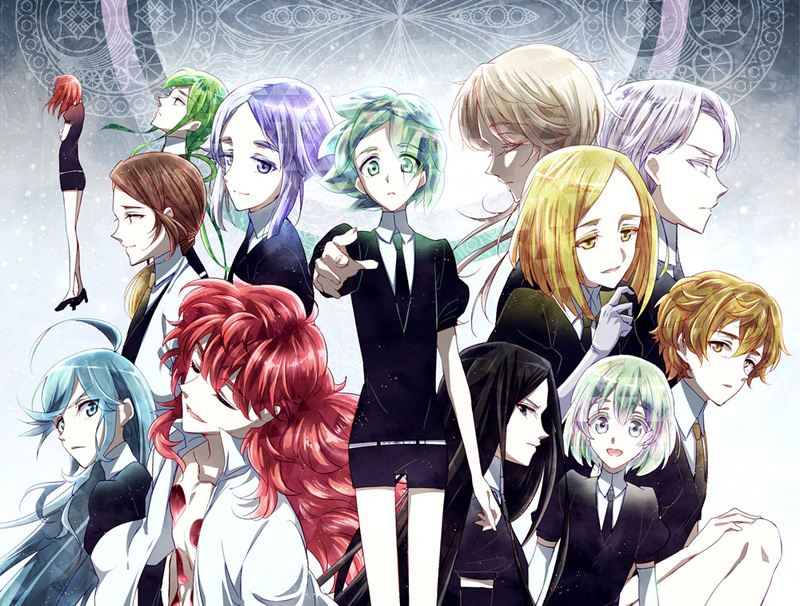 A lot of the time, it seems awkward, out of place, and is generally used as a cost-cutting measure to mask some deficiencies, but Houseki no Kuni (TV) doesn’t fall into that trap at all. Hats off to Orange, because this is a gorgeous anime that simply wouldn’t be the same had it been animated using traditional hand-drawn animation. I enjoy sakuga as much as the next person, yet I don’t think it has anything on many of the action scenes here, which wouldn’t really be out of place in a game like Platinum Games’ Bayonetta. Style is something that this anime isn’t lacking in the slightest, and I haven’t even mentioned the beautiful vistas, impressive character designs, exquisite direction and cinematography, or just how much more fluid and dynamic this looks than the CG we’re used to seeing in various other anime. With this anime, I’m sure the visuals will be the main focal point for a lot of people (me included), but don’t overlook the audio, which holds its own quite nicely. The music matches the mood of what’s going on on-screen superbly, and it doesn’t matter whether it’s an epic action scene, the arrival of those creepy Lunarians, or any of the more poignant moments, make no mistake that this is high quality stuff. At a couple of points during the show, I’m pretty sure I even heard the mizmar or mijwiz, and it’s kind of impressive to see the influence of some cultures. So while the animation deserves a lot of praise, the high production values of Houseki no Kuni (TV) definitely extend to the music as well. 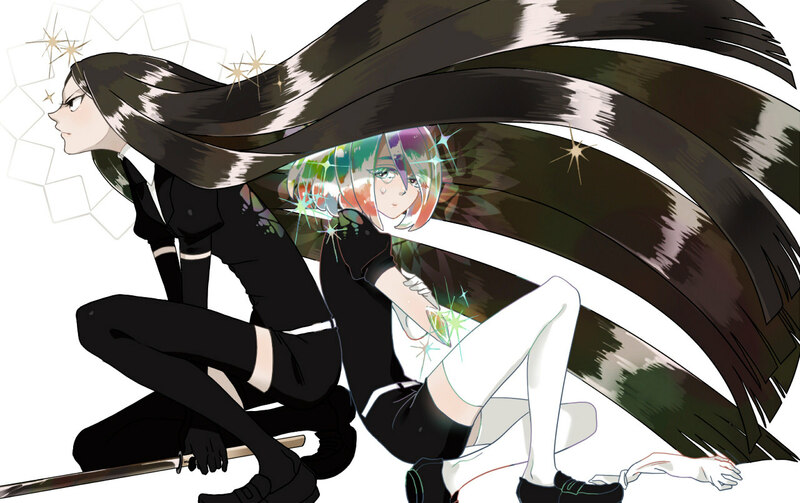 This entry was posted in Anime, Anime Review and tagged Houseki no Kuni by Rock The Vogt. Bookmark the permalink. What a great character we have in Phos. So brash and playful at the start, and at the end resolute and capable. It’s all about the journey of discovery though, as she picks up imperfections and improvements, and experiences loss and betrayal. It’s those things that are responsible for creating the amalgam she becomes. Choosing a favorite couple is pretty tough, though I do lean towards Phos and Cinn. Dia and Bort take a close second, but it looks like they still need to resolve a few things. Also, it seems Bort is also quite the unintentional lady killer! The whole show was a blast, and I agree, it did a great job of pulling you into all the characters. And wow! What a read it is! The anime seems to match up to about chapter 32 of the manga plus a scene from 36. For reference chapter 64 is the latest translated. I have to say the anime really follows the manga precisely, at least until the very end where they kind of tack on that ending. You can really tell the wonderful story telling from the manga coupled with the amazing animation really makes this one shine. Based on what I read the end is (probably) now close. So if they make a second season of the anime then that should wrap things up neatly. I’m glad you picked it up – but that pun was uncalled for! 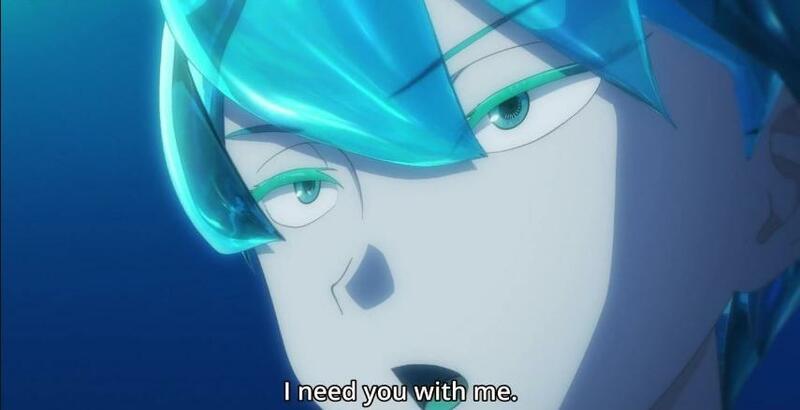 I think the anime managed to tell a singular story of Phos’ development from… naive to painfully grown up, and exhibited a massive change. The story definitely setup threads, but a 1-cour season wasn’t nearly enough to complete it all – not that I mind, of course, but we need that second, and maybe third or fourth season too. Most of all about this series was the comedy. I love a show that can succeed at so many different things, but this was a show that did not only top notch comedy (creatively mixing a sharp script and physical humour – I expected no less from the Love Live director), but there was also great action, tense horror, compelling mystery, romance and so much more! It was a real treat to see something so far reaching, and to succeed triumphantly at everything it tried. I’m glad you picked up on the music! The main theme of the Lunarians was a gamelan piece (possibly to tie in with their Buddhist influences) and there was so much chromaticism. Yet, the soundtrack had the bombastic string whooshes in good measure at huge climaxes. I was very much reminded of Western movies featuring John Williams or Hans Zimmer, but it turns out that the music was pre-composed and scenes were highly choreographed to it, and it really showed at some of the highlight scenes like Dia’s run across the island or the run from Shiro. I want to see more – and it sold well and has done well in Japanese anime circles… but I think it might be a while before we see it. Apparently, Orange had been setting up a lot of the 3d framework for a couple of years prior, and had extensive amounts of motion-capture and 2d animation to use as a basis, so it was a BIG project. I do think it’ll happen because it was very successful, but it might not be as soon as we’d like. The manga is still ongoing and this only covered about 3.5 volumes, and there’s 8 total and they’re still coming. There’s a lot of room and I’m very optimistic. And Houseki no Kuni outsold them all! On top of something like doubling or maybe even tripling manga sales. The comedy was nice. Afterwards, I found myself scouring YouTube trying to find some of those specific moments… but I didn’t have too much success. And it did so many things well! I almost never check the list of staff, but maybe I should start. *starts to listen to the OST* Very nice. very nice. That makes sense. If you’re go through all the trouble of creating that infrastructure, you’re probably going to need projects that utilize them. It wouldn’t make too much financial sense to have it be a one-off or something. Some of your puns are great but some are… well… puns. Most of the funny bits are just tightly woven into the script as extra sharp or silly retorts so they probably don't stand out as hilarious jokes like Angel Beats has or something. Still, there's a compilation of Phos noises! The OST was really beautiful! I really enjoyed it – even if it wasn't necessarily as creative as Made in Abyss' soundtrack. I do like to keep on top of knowing who is who in the anime industry, though it's not easy. There's a few names that standout to me (like Kunihiko Ikuhara, Mari Okada etc), but some people have a really clear style – and I think this a definitely example of it, with great physical comedy. Yeah there is that too; so much work has already been done it would really be a waste not to do more. And there's so much more to do! I think it's just a matter of time, really. Personally my AOTY. And that’s very surprising since this is a CGI anime. I don’t even think it would be a good as it is if it was traditional anime. I really hope a second season does appear because that ending didn’t feel like an ending. Yeah, some of those action scenes would have had to have been hell to animate at the same quality. I rewatch the Bort/Dia battles with Shiro from episode ten a lot, and I can’t imagine it being anywhere near as epic with hand-drawn animation.